Pregnant rapid belly expansion is just one of the issues some women have to deal with during pregnancy. Learn why this may happen and get some ideas that can make your life easier. When Does Pregnant Rapid Belly Expansion Occur? How big and how fast your belly expands during pregnancy depends on various factors. Typically, a first time pregnant woman might not experience as rapid a belly expansion as she might in her next pregnancies. However, keep in mind that all women and all pregnancies are unique. What's average is that around the third month of pregnancy, your clothes will likely become tight around the waist. Most women need adjusted clothes or maternity clothing by the fourth or fifth month of pregnancy because of the normal rapid growth of the fetus and uterus. Pre-pregnancy overweight: Women who are overweight before pregnancy are more likely than average-sized women to gain more than the normal recommended weight in pregnancy. Too many calories: You can also experience rapid belly growth if you eat too many calories and gain weight too quickly during pregnancy - even if you were of average size before you became pregnant. Attention to a healthy pregnancy diet and exercise will help you control your weight gain. 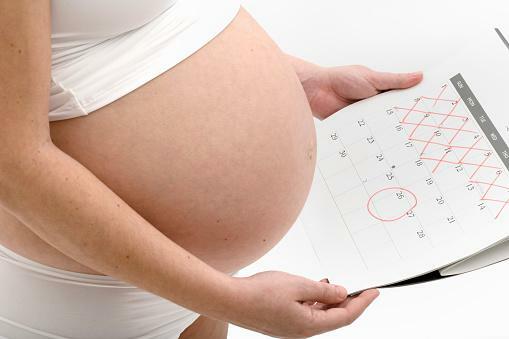 Incorrect dates: If you are uncertain of the date of you last normal period, you might be further along in your pregnancy than you believe. This is not an unusual cause of a bigger uterus and belly than expected. 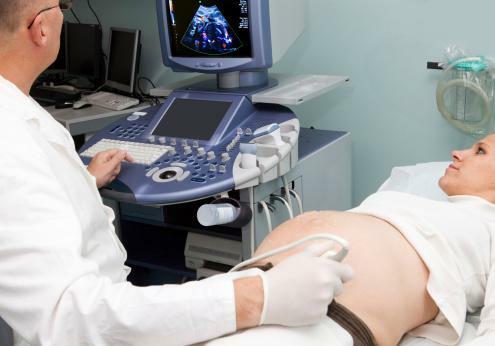 An early ultrasound can help correct the gestational age of your fetus. Multiple babies: If you are carrying twins or other multiple babies, your uterus will grow faster than the normal pattern of growth and cause a more rapid belly expansion. Second time around: Second and subsequent pregnancies might result in a more rapid belly expansion than a first time pregnancy. This is because the stretched out muscles can make your belly appear to expand faster. Body size and shape: No two women's growing pregnant belly looks the same at each stage. If you're normally slender and/or petite, your belly might appear to be expanding faster than your larger-size friend's, and you will show quicker. Gas and bloating: Gas can cause your pregnant belly to bloat and appear much bigger than normal. Slower bowel activity and not getting enough water and fiber lead to constipation, which is common throughout pregnancy. This causes gassiness and pregnancy bloat. Polyhydramnios: Polyhydramnios is a more-than-normal amount of the amniotic fluid surrounding the fetus - usually diagnosed after 20 weeks of pregnancy. Causes include maternal diabetes and heart disease and fetal neural tube defects. A larger than normal baby: If your fetus is larger than normal for its gestational age (LGA), it will make your uterus and therefore your belly bigger than expected. LGA or macrosomia is usually more evident in the third trimester. Causes include maternal gestational diabetes, pre-pregnancy obesity, a big pregnancy weight gain, and a previous history of an LGA baby. Molar pregnancy: A molar pregnancy, or hydatidiform mole, also causes the uterus to be larger than dates. It is caused by abnormalities in the number of maternal or paternal chromosomes. A mole is usually diagnosed in the first or early second trimesters as a cluster of grape-like tissue in the uterus on ultrasound. Fibroid tumors: Benign fibroid tumors in the uterus grow rapidly in about one third of women, according to a 2010 Obstetrics and Gynecology article. This will cause the uterus and pregnant belly to expand faster than usual. Symptoms can include increasing pelvic or abdominal pain. Ovarian mass: A big ovarian tumor and other abdominal masses during pregnancy can cause your belly to expand quicker than normal in any trimester. Pressure and pain are common symptoms, and diagnosis is made by ultrasound or MRI. Stretch marks: The faster your belly expands, the more likely you are to get stretch marks. Stretch marks can be itchy, and some women are really bothered by how they look. If you're having problems, ask your health care provider about a safe stretch mark cream to use. Asking first is important because medicated creams, even over-the-counter, may not be safe for your pregnancy. Poor body image: You may feel more self-conscious about a rapidly expanding belly and might feel fat and frumpy. Being pregnant is an adjustment, but being suddenly huge is an even harder adjustment for some women. Try to wear clothes that minimize your belly - look for flattering maternity fashions in maternity boutiques. If you feel depressed, talk to your health care provider. Shortness of breath: A rapidly expanding belly can cause you to have shortness of breath. As your belly expands, there is restriction on the movement of your diaphragm as you breathe in. Slow, deep breathing and other relaxation exercises can be helpful. Increased back pain: Back and pelvic girdle aches and pains are just a few of the common discomforts of pregnancy. The extra weight on your belly throws off you posture and can put a bigger strain on these areas and worsen your distress. Talk to your doctor about ways to manage this problem, including safe exercise during pregnancy. Ease your discomforts with maternity shapers and support garments, a pregnancy pillow, or a birthing ball to support your belly and back. Loose skin: The bigger your belly gets during pregnancy and the more rapid the expansion, the looser your skin will be after delivery. Once your skin is stretched beyond a certain point, it is difficult to revert to normal through exercise and diet. Attention to your pregnancy diet and weight gain will help you manage this problem. A complete physical exam, ultrasound, and other necessary testing will discover if there is a worrisome cause. If your belly and/or uterus is bigger than normal for your weeks of pregnancy, chances are your doctor or midwife will notice this on your routine prenatal exam. If he or she does not, don't hesitate to communicate your concerns to your provider.